Planning for Light Up Market Street Project includes video projection. “Giant” lives above The Luggage Store on the west facing wall of Market St.
View on Market & 6th Street. Untitled, by Osgemeos with Mark Bode, north facing wall of the Warfield Building. A series of conversations about art, class and race that emerged from “Block by Block,” a public art project. The use of public space is complicated, especially in San Francisco. For this reason, the Kenneth Rainin Foundation worked with a professional writer to document our experience in this blog series and share the genuine perspectives of the many people involved with “Block by Block.” Our hope is that by illustrating the risks of working in public space and sharing the outcomes and insights gained from this public art project, we can push dialogue and understanding forward. We invite you to click among the interviews with the stakeholders, consider them, and then join in the conversation by responding to the posts. When the Kenneth Rainin Foundation set out to bring public art to Central Market, it knew it was an experiment. It’s one thing to install art in a museum, with tickets and suited docents setting a formal tone. 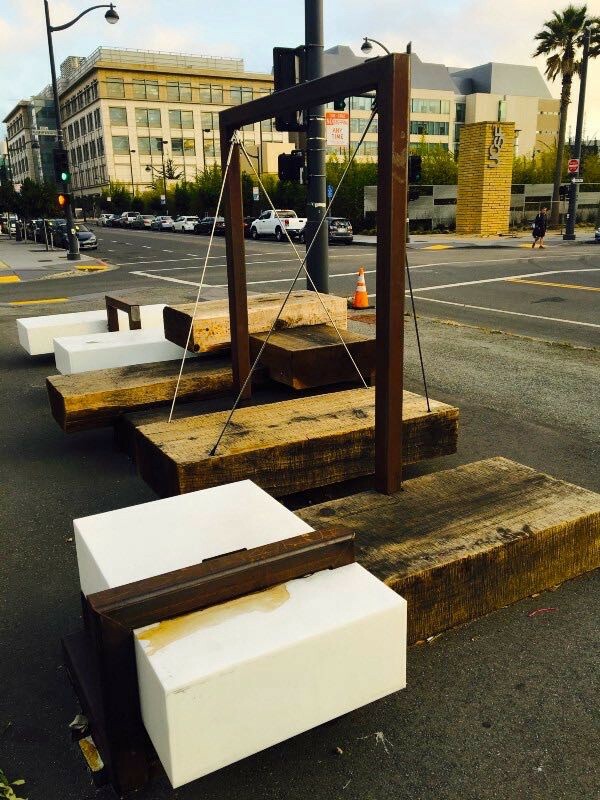 It’s another to install art on a busy San Francisco street known as much for crime and homelessness as swank cafés and sleek towering apartments. The city’s economic extremes come into sharp relief: technology workers pour into the companies ushering in the future, passing by those left behind by the city’s boom. The Rainin Foundation felt Central Market was ripe for a project that could start building bridges. Public art can reach broad audiences and the Rainin Foundation felt Central Market was ripe for a project that could start building bridges. While public art is not designed to solve systemic problems, it can serve as a vehicle for bringing people together in new ways and for developing creative interventions. This project included illuminating the area’s murals at night and installing a sculptural element called “Block by Block,” a platform intended to offer some fun, encourage interaction, and incorporate visual novelty into what is now an empty streetscape with few places for gathering. 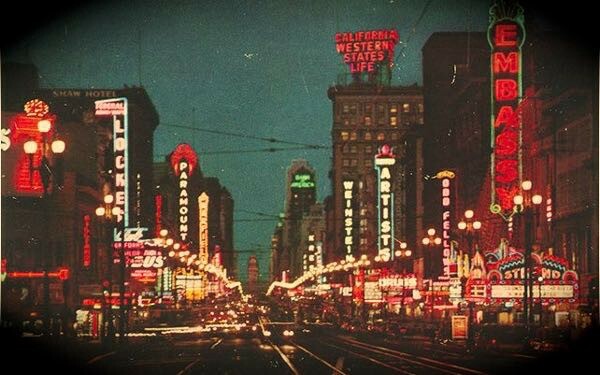 A postcard image of Mid-Market in its 1950’s prime. Central Market’s lack of seating isn’t a coincidence. As the boulevard of grand theaters and department stores decayed during 1960’s BART subway construction, the benches that had become resting places for homeless people were removed. More recently, the chess tables on Market Street were cleared away along with the heavy chains between posts along the street. As new money pours into the area, the only seating is private, the property of cafés catering to the city’s more affluent. “Block by Block” was intended to change that. The piece was designed by Marisha Farnsworth of Hyphae Design and installed last September near Sixth and Market streets. The series of platforms begged to be sat on, with a swing, lighting, and a soundscape. The Foundation’s partners at the city who helped bring this project to fruition were watching closely, since they are in the middle of developing plans to reinvigorate Market Street that will include public art. But within weeks of the installation, the experiment looked to be teetering. “Block by Block” was taken up by a group who stayed all day and played music into the night. Some were allegedly selling drugs and making passersby feel unwelcome, and in at least two cases, attacks were reported at the installation. The Luggage Store started hearing complaints from merchants, the city, and people living nearby. In a country where issues of class and race are at a boiling point, “Block by Block” plunked those tensions right into the heart of San Francisco’s polarizing economic boom. The collective good intentions behind the project entered sticky territory: Just whom is public art meant to serve? Bringing art to that spot had been a feat of collaboration — requiring permits, coordination among city departments, and buy-in from nearby merchants and arts organizations. These relationships were tested as the discord mounted, and eventually, the city informed the Luggage Store that the platform had to go. 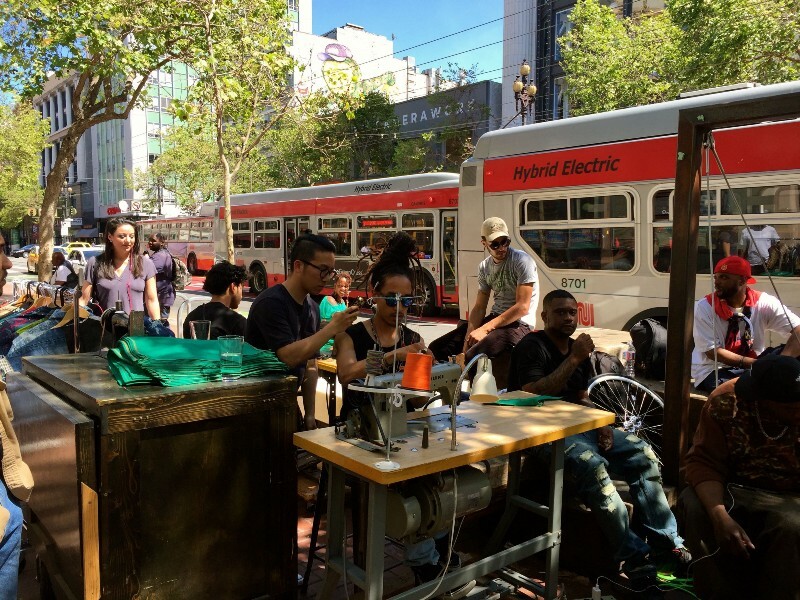 In May 2016, eight months after arriving on Market Street, “Block by Block” was relocated to a sidewalk out in Mission Bay, a newly developed neighborhood of hospitals and biotech companies with little foot traffic. The Foundation intentionally supported art in the public realm — knowing the risks involved — and thought the discussion of what happened should be public too. To start the conversation, stakeholders were interviewed by a professional writer and their thoughts are presented in “as told to” style narratives that are lightly edited for length and clarity. Click among these interviews, consider them, and then join the conversation by responding to the posts. In many ways, that’s what “Block by Block” was intended to do. What do you make of this experience? Why does it matter? What lessons can be learned from it? Is public art a beacon of gentrification, or can it unify disparate groups?